Philipp Adam Hahn was born on September 23, 1873 in Norka, the son of Adam Hahn (born 1831). He was confirmed in the Norka church in 1889. Philipp Adam married Anna Christina Hohnstein on February 13, 1901 in Norka. Anna Christina was born on June 9, 1877, the daughter of Friedrich Hohnstein (born 1846) and Katharina Nagel (born 1854). Philipp Adam and Anna Christina became the parents of three children while living in Norka: Jacob (born 1902 and died later that same year); Elizabeth (born 1903); and, Magdalena (born 1906). In the early 1900's, Philipp Adam served in the Volochyskiy Brigade of the Russian Border Guard. This unit was formed in 1893 and was a part of a larger special Russian Imperial Army Unit tasked with border patrol. The Volochyskiy unit's headquarters were located in the town of Volochysk of Starokonstantinovsk uyezd (district) in Volhynia Province. This geographic location is now part of Ukraine. Drawing of Philipp Adam Hahn. 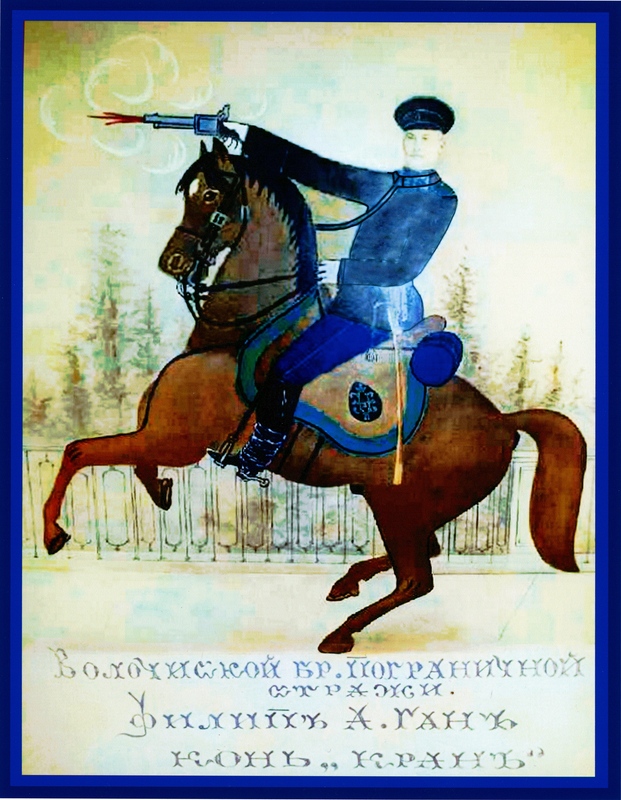 The inscription reads: Volochyskiy Brigade of the Russian Border Guard, Philipp A. Hahn, horse "Kran". The drawing was provided courtesy of Adam Hahn, Jr. of Portland, Oregon. Having fulfilled his military service, Philipp Adam, along with Anna Christina and their two daughters immigrated to the United States in 1907. They arrived in New York on April 13th aboard the steamship Campania which had sailed from Liverpool, England. The steamship manifest indicates that they were bound for Portland, Oregon. The Hahn family settled in the heart of the Volga German community in Portland, joining friends and family from Norka. Four more children were born in Oregon. A son, Conrad was born in 1909, a daughter Katherine (Ruthie) was born in 1912; a son, Adam, was born in 1913 and another son, Philipp Jr., was born in 1915. The family attended the Free Evangelical Brethren Church. At the time of the 1910 U.S. Census, the family was living at 763 Rodney Avenue in Portland (now 3615 NE Rodney Avenue) and Philipp Adam was working as a teamster using his own wooden wagon. At the time of the 1920 U.S. Census, the family was living at the same location. Philipp Adam was working as a car repairman for the railroad at that time. In 1930, the family had moved to 801 Rodney Avenue (now 3815 NE Rodney) and Philipp Adam continued working for the railroad. The family continued to reside at 3815 NE Rodney in 1940. Sons Conrad and Philipp Jr. (along with his wife Emma Bitter) lived in the same household. ​Philipp Adam died on July 28, 1951 was buried at the Rose City Cemetery. Anna Christina died in 1956 and was buried next to Philipp Adam. Translation of the drawing text by Tanja Schell. ​Information about the Volochiskiy Brigade provided by Vladimir Kakorin. ​Research compiled by Steven Schreiber.